Clarksville, TN – Austin Peay State University men’s basketball will host UIC, 7:00pm, Wednesday, March 20th, 2018 in the quarterfinal round of the CollegeInsider.com Tournament. That was announced Saturday, ahead of the four remaining second-round games in the CIT. The Govs, UTSA and Liberty are already announced as hosts, with the remaining host site and opponents to be determined Saturday. This will be the first-ever meeting between the Govs and Flames, who finished third in the Horizon League at 18-15, 12-6 in the league, before falling to Milwaukee in the Horizon League Basketball Championship quarterfinals. UIC dispatched Saint Francis (PA), 84-61, in its first CIT contest, March 14th, with Clint Robinson’s 15 points leading six Flames in double figures. UIC boasts a solid, deep squad that contains both the Horizon League Defensive Player of the Year (Tai Odiase) and Sixth Man of the Year (Godwin Boahen). Six Flames average more than 8.0 points per game, with Dikembe Dixson (14.2 ppg) and Marcus Ottey (13.4 ppg) leading the way. Offensively, Tarkus Ferguson (5.3 assists per game) runs the show, while Odiase’s 3.3 blocks per game leads an inside presence that’s second nationally in total blocked shots (234) and blocks per game (7.1); Odiase himself is fourth with 108 total swats and will make for an interesting matchup for Austin Peay’s Terry Taylor and Averyl Ugba. The Govs and UIC only have one common opponent this season—Troy. The Flames fell, 87-66, to the Trojans in their final game at the Adolph Rupp Classic, while the Govs took down Troy in a hotly-contested 75-73 matchup, December 19th. Four Flames hail from outside the United States—Ottey and Boahen (both from Ontario, Canada), Robinson (Montego Bay, Jamaica) and Jordan Blount (Cork, Ireland). UIC is heavy on underclassmen, with only Odiase, Robinson and Naradain James past their sophomore year of eligibility; for one of few times this season, the Govs—with Ugba, Tre’ Ivory and others—may have the upperhand in experience. Steve McClain is in his third season at the helm of UIC, compiling a 40-59 record and taking the Flames from 10th in his third season to the CBI semifinals last year and third in the Horizon this year. McClain formerly was the head coach at Wyoming, going 157-115 over nine seasons and winning two Mountain West regular season titles and the 2002 MWC Tournament title; the 11th-seeded Cowboys then defeated Gonzaga in the First Round of the 2002 NCAA Tournament. 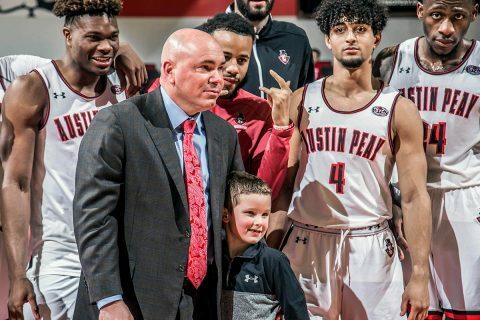 Like Austin Peay, this is UIC’s second run in the CIT; the Flames advanced to the second round in their last appearance, in 2013, before falling to Northern Iowa. Tickets can be purchased immediately by visiting www.letsgopeay.com/sporttix or calling 931.221PEAY. Thanks to the generosity of Jenkins and Wynne of Clarksville, all active duty military members will receive a complimentary ticket to Wednesday’s game, which tips at 7:00pm against an opponent to be determined. Meanwhile, the kindness of Echo Power Engineering, LLC, will provide free tickets for all students with current university ID. For everyone else, tickets are $20.00 for reserved seating, $15.00 for general admission and $10.00 for kids (ages 3-12). Governors Club members with reserved parking (Monocle Level or higher) will maintain their parking spots, using the same pass they were issued earlier in the season; if you have already disposed of your parking pass for the year, the gameday parking lot attendants will have a list of qualified donors for their respective spots. The Governors Club hospitality area will be available to members at Monocle Level or higher from 6:15pm to 7:00pm and again at halftime.